Our 100th Author Birthday Celebration! Right now, every day is a celebration for Rod Campbell at our house. My 10 month-old son absolutely loves his book, Dear Zoo. We read it at least once a day and he often pulls the book from his night stand by himself, pages through, and lifts the flaps. 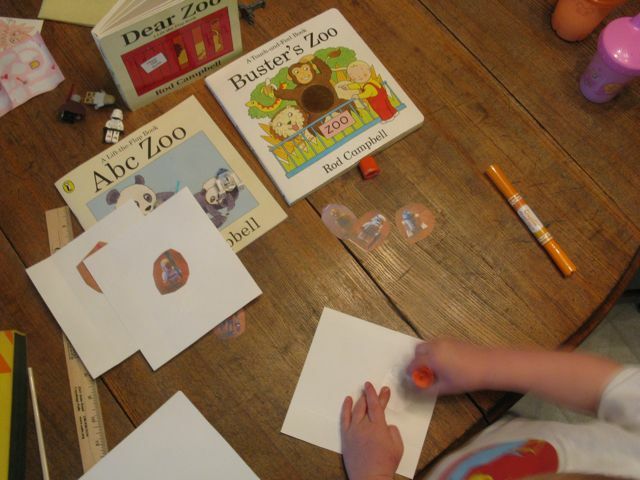 I whole-heartedly agree with a statement from Rod Campbell's website, "For the youngest, a degree of physical involvement is crucial in drawing the child into a book, and maintaining their interest." Dear Zoo was first published in 1982 and is now available in many forms including an activity book, a buggy book, a pop-up book, and a little library. Rod Campbell considers himself to be a "maker of books" rather than an author and an illustrator. He believes in "using flaps or pop-ups in a book only when it gives an extra dimension to a simple story or when the flaps will serve to enhance the 'reality' of certain images." In Dear Zoo, a letter is written to the zoo asking them to send a pet. 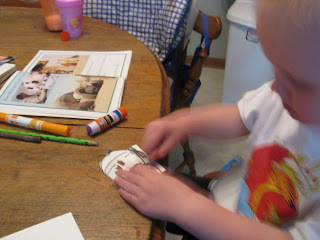 Each page has a container sent by the zoo which the reader must lift the flap to see what's inside. There is no text about what is inside, just an image. In this case the flap is very important because it provides an element of surprise. Plus, I find it to be the perfect opportunity to make fun animal sound effects when the flap is opened. However, I haven't figured out the sounds for a giraffe and a camel! Unfortunately, the child finds something wrong with each animal (the giraffe is too tall and the camel is too grumpy) and sends them back to the zoo. Eventually, the zoo gets it right and sends the perfect pet! 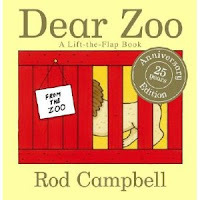 The success of Dear Zoo lead Campbell to create his own publishing company focusing on books for children under the age of 5. Campbell Books was later sold in 1995 to MacMillan Books but they kept the name and continue to publish for young book lovers. (Click here to view the variety books that are available). 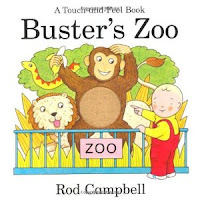 If your child loves going to the zoo there is also a book by Rod Campbell from his Buster Series, Buster's Zoo. There are a few Lift the Flaps along with some touch and feel elements. 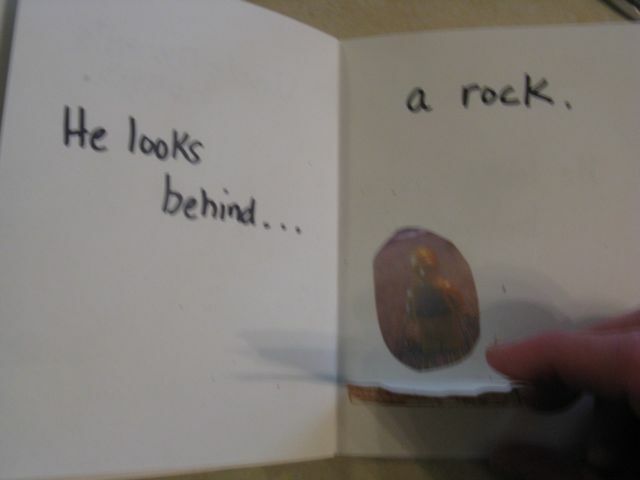 My youngest son loves this book too. His favorite part is the monkey hiding under a tablecloth. This is a special post, not only because we love Rod Campbell's books, but because this is our 100th author birthday we have celebrated on the blog. I have added a list along the right hand side of the blog that contains links to all the celebrations we have had over the years. It has been quite a journey for me as a father and blogger. When I started the blog, I was posting information online to clear out file folders of author birthday celebrations I had held when I was a teacher. My mom saw the work I was doing and she encouraged me to take the blog more seriously. Then, I saw an opportunity to celebrate author's birthdays with my family. Once I was confident in my writing, I began contacting authors for birthday memories and posting pictures of the activities we were completing at home. I appreciate all the support I have from my family and friends. I need to thank all of my readers and the authors that I have corresponded with through email. I appreciate all the positive comments! The best way for us to celebrate Rod Campbells' birthday was to make our own Lift the Flap Books. 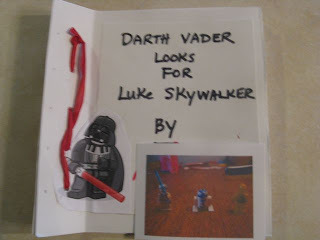 This was a very exciting craft for my children. My 3 year old son and I made his book on Sunday afternoon while his sister and mom were at the ballet for a Girl Scout outing. He was super thrilled with the completed book. He declared, "I am an author!" Then, he said, "Dad, you are the illustrator." I told him that he illustrated the book too by coloring the pictures and taking the photographs. Then I said, "Today, you were a lot like Rod Campbell." 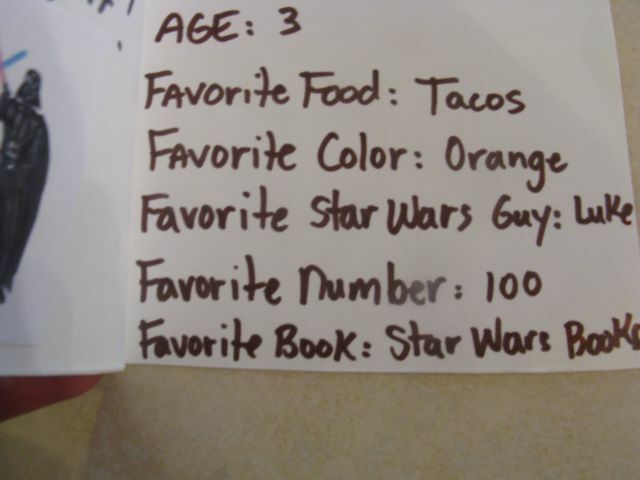 He responded, "I wonder if he likes Star Wars." 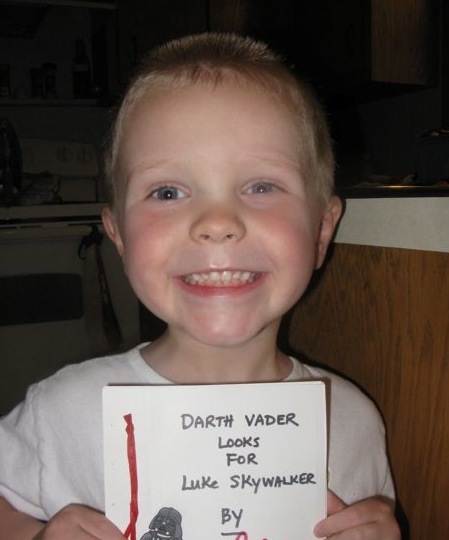 We took pictures of his Star Wars Lego guys and printed them on regular white paper. He then glued the characters to the pages of his book. His book was about Darth Vader trying to find Luke Skywalker. A flap on each page hid one of his Star Wars Lego guys. In the end, Darth Vader finds Luke and they have a Lightsaber battle. The author of Darth Vader Looks for Luke Skywalker. We tried to keep the text simple just like a Campbell Book. We included an "About the Author" page too. Thank you Rod Campbell for sharing your birthday with us. My daughter was so excited to hear from you after the email she sent a few months ago. Your books have had a very positive impact on our family. We hope you have a wonderful birthday! Happy 100th Birthday post. Please tell your kids they did a wonderful job on their books. Dear Zoo was one of my family's favorite books. I enjoyed learning more about Rod Campbell. Congrats on hitting 100 celebrations! A wonderful achievement! Those two home made books are brilliant! And HAPPY 100TH CELEBRATION. Your son's author page is a wonderful touch! I am also a fan of Dear Zoo!